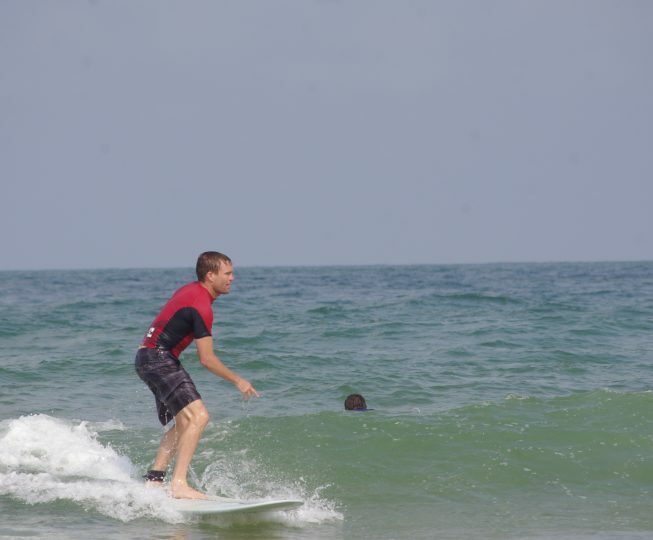 Beginner: Surfing in the white water, turning left and right in the foam. 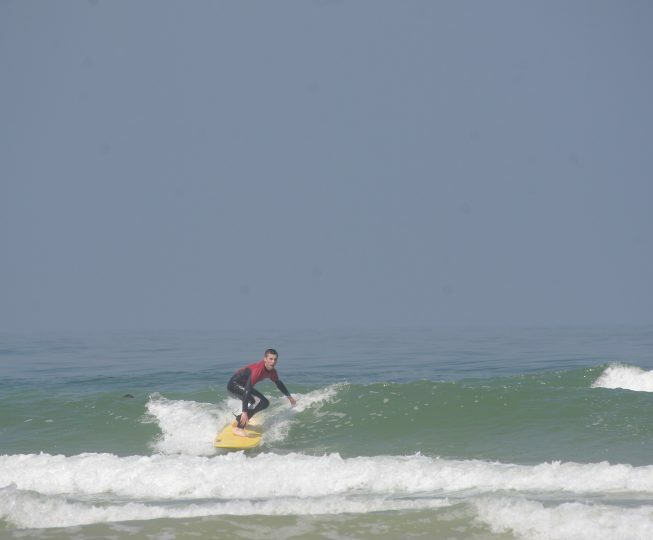 Intermediate: Out back, sitting on the board, starting to take small green (unbroken) waves, conditions permitting. Turning left and right on small unbroken waves. Advanced: Turning confidently both left and right on the open face of a wave, keeping in speed, front side and backside with the curl or pocket. Introduction to first manoeuvres, top turn, bottom turn, cut back, duck dive. Allows the novice surfer to get a real feeling for surfing in a safe environment and with the correctly adapted material. The lesson lasts 2hrs. Maximum 8 surfers per group. 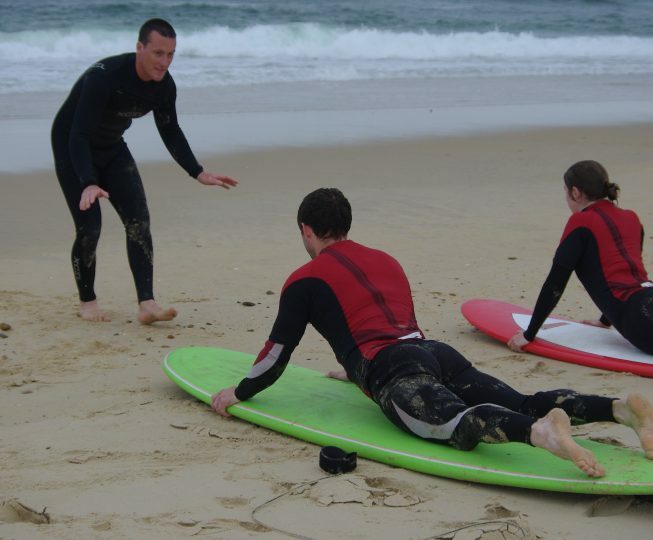 The adult surf lesson encourages you to increase your awareness of the sheer force inherent in nature. You will appreciate the pure size and power of the ocean first hand. You will also learn how to appropriate these forces whilst discovering your own limitations. But above all you will have an amazing time and really enjoy yourselves in the process. As a surfer, you will also learn about other aspects of surfing such as self control and respect. You will learn how to confront, accept and deal appropriately with challenges, but also, how to deal with frustration. Once you put all of these aspects together and add a certain level of apprehension you will find that you surpass yourselves. You will see a rise in performance and self esteem, resulting in an increased confidence in your own capacities. Themes : Discovering and adapting to a new environment. Discovering ones own limits. Self confidence. Learning to listen to ones instincts and gain a certain level of skill in reading and understanding an important element in nature, which in this case, the ocean. 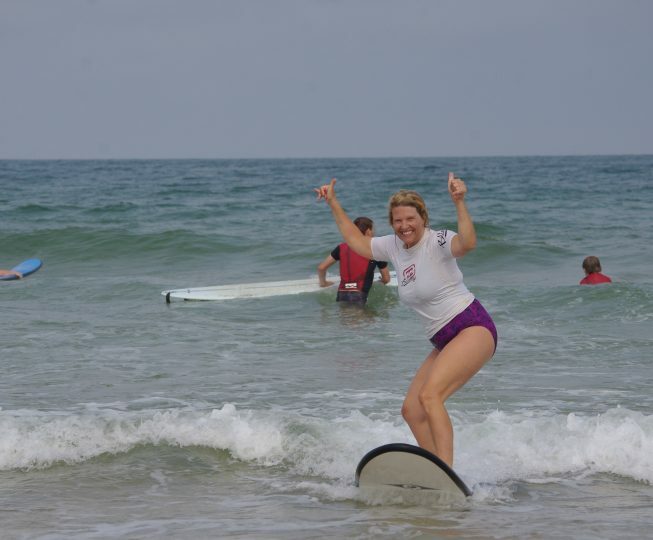 An example of a standard beginner surf lesson. Finding your balance on the surfboard in a lying position: on the beach then in the water. The aim is to catch a white water wave or broken wave whilst lying on the surf board. This will allow you to become accustomed to the handling of the equipment in the ocean, the correct positioning and the general process of catching a wave before taking it any further. When you nose dive and you will nose dive you are understanding the importance of weight distribution on the board and it’s effects. Having the right equipment is a big part of success. The surf board must be suited to your height and weight and to your ability. We provide wetsuits that are specifically suited for men, women and children, and that are adapted to the season. Spring suits (3/2), summer suits (2/2) and winter suits (4/3). Winter Surf Accessories: hood, gloves and booties. Access to the changing booths (heated in the winter) and a place to store your personal affairs in safety. 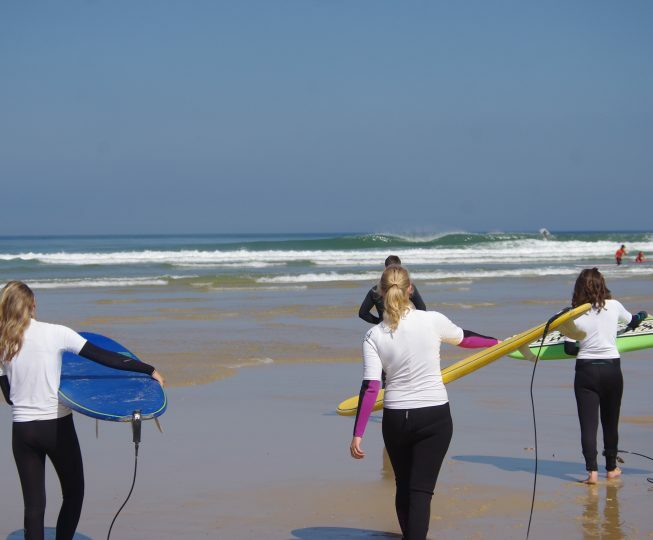 The intermediate surf lesson encourages you to increase your fitness levels and maintain a healthier lifestyle. As a surfer, you will also learn self control and respect, how to confront, accept and deal appropriately with challenges, but also, how to deal with frustration. Mix all of these in with a certain natural level of apprehension and we have the perfect mix for a solid rise in performance and self esteem, resulting in an increased confidence in your own capacities. Themes : Discovering and adapting to a new environment, in this case we’ll be out back behind the breaking waves in the line-up. Discovering ones own limits. Self confidence. Learning to listen to ones instincts and increase your level of skill in reading and understanding an important element in nature, waves. Warm up (40m run) and stretch on the beach. Learn to pin point your entrance to maximise your chances of an easy approach. Line up positioning once out back. How to use the sand banks and deep water troughs and their respective currents to help you. Understand the different techniques (Eskimo roll – duck diving etc..) that are available to the surfer to make it through the white water and out back when in a paddling position, that is lying in a flat position on the board. Explanation, demonstration and practice on the beach before practising in the water. Learn to surf the wave in the curl or the pocket. Learn to read the waves, lefts and rights. Learn how to adapt to lefts and rights by choosing the correct direction to take on the wave. Positioning, where to take the wave, and the timing, when to take the wave are crucial steps to a successful take off and ride. 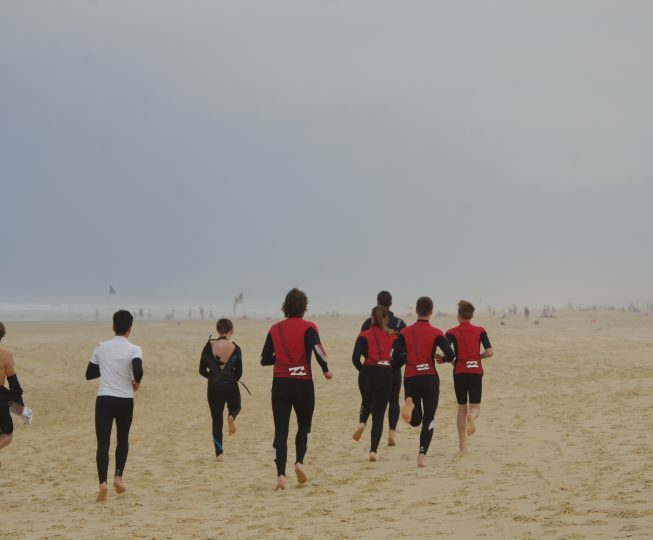 Explanation, demonstration and practice on the beach, then into the water to train. Our aim is to get you riding on the green wave (unbroken part), in order to gain and maintain enough speed to outrun the foam. This will allow you to become familiar with what we call the open face of the wave that evolves further along the wave into the shoulder. This view and position will open up a whole new area and an array of possibilities from which you can start performing manoeuvres..
Introduction to two paddling techniques: positioning paddling and take off paddling. 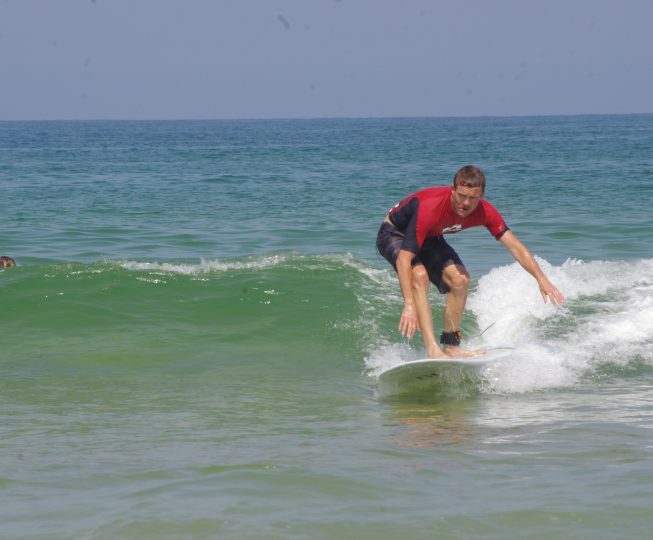 Introduction to basic turning techniques: starting with the direction assisted take off (turning the board in the correct direction that corresponds to the wave before the take off), and then onto the bottom turn (going straight down the face of the wave and performing a high speed turn at the bottom of the wave). You learn the importance of weight distribution and it’s affect on the board and on your speed. Introduction to kicking out of the wave. 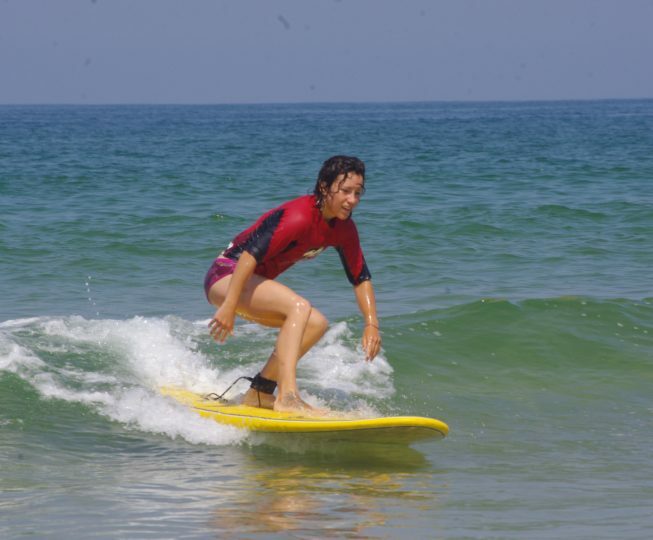 The objective of the lesson (conditions permitting) is to try to stand up on the board before the wave breaks and turn either left or right (depending on the wave) in order to surf on the open face of the wave. The key is selecting the right wave that will allow you to do this, then getting in the right position and giving it 110% in the paddling to get onto that wave. 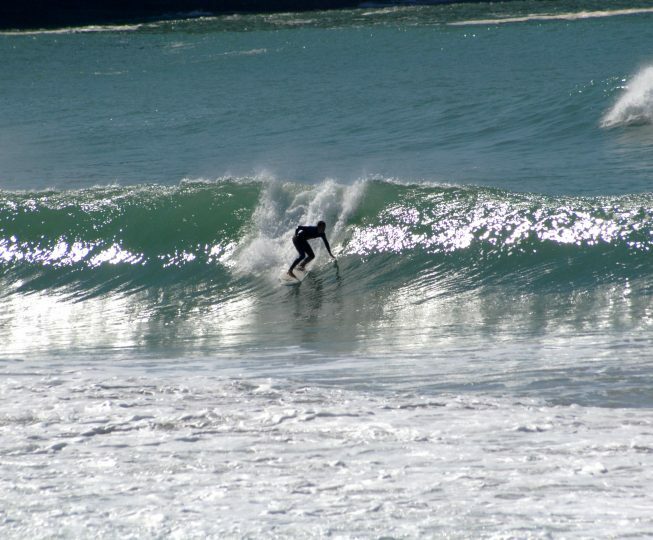 If the ideal conditions are not available for example the waves are too big then these techniques can be performed on wave reforms closer to the beach. Having the right equipment is a big part of success. The surf board must be suited to your height and weight and to your ability. We provide wetsuits that are specifically made for men, women and children and that are adapted to the season. Spring suits (3/2), summer suits (2/2) and winter suits (4/3). Advanced surfers generally don’t think about taking surf lessons. However, lessons at every level are an important way to constantly improve your surfing skills and techniques. Even Kelly Slater has a coach. At this level the surfers needs are very individual and surfer specific, so personalised coaching or private lessons can be the right choice. At this level you can also opt for our surf guide formula. This will allow you to find the best waves that are suited to your level and at the same time have your very own surf instructor on hand for tips and analysis. Themes: Better reading of the wave and the way in which it is breaking. Correct anticipation of the breaking wave will allow you to position yourself better. Using the face of the wave to gather and maintain speed. Manoeuvre selection: the manoeuvre that is best suited to that type of wave or that specific part of the wave. In depth analysis of each manoeuvre, with it corresponding weight distribution and orientation of the head, shoulder and hips. Introduction to bio-mechanics in surfing. Having the right equipment is a big part of success. The surf board must be suited to your height and weight and to your ability. We provide wetsuits specifically made for men, women and children, and that are adapted to the season. Spring suits (3/2), summer suits (2/2) and winter suits (4/3).